After the Civil War, the "up picking" finger style of playing the 5-string banjo came into vogue. The original down picking style didn't entirely die out because new methods for the banjo often included a number of songs in the older two-finger banjo style., Perhaps the most intricate set of songs to appear in the "original" banjo style were these 34 progressive pieces found in Frank B. Converse's Analytical Banjo Method from 1887. 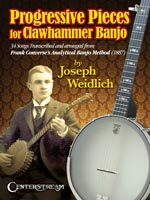 Those songs, presented in this for clawhammer banjo, offer a nice mix of banjo characteristic pieces, medleys and new compositions.